We are eating quite well from our pantry and freezer; I'm lucky to have browned ground beef frozen in bags, tons of tomato products, and pasta of many shapes. If you make them wait long enough between meals, they will LOVE the whitefish! You could make maybe do a crumb coating and make them into fish sticks. I also love any white fish if I mix mayo and Parmesan cheese together and top it on top of the fish. Then I cover it with bread crumbs and some Italian seasoning. Bake for 400 degrees and cook for ten to twelve minutes. We call it fish ala sprinkles :) My kids love it! Meredith, you do things with such grace. I admire that very much. I am sure that what ever you do with the white fish it will be wonderful. I'm a pretty picky eater when it comes to fish, but i love this Teriyaki marinade on fish. I would let it marinade as close to 24 hours as possible and then cook as you like. Good luck on the fish. When I find things "creeping" in the back of my freezer it is usually fish. Months ago,in an attempt to vary our diet a bit I bought a package of frozen salmon patties. It was like eating cardboard. I tried jazzing them up the next time with mayo and cheese and bread crumbs but it really wasn't an improvement. A few weeks ago I found the lone remaining patty in the back of the freezer, still in the package. I very unfrugally dropped it in the waste basket. I wasn't about to try and divide one patty, that no one liked, six ways and I surely didn't want the Lord providing a miracle with that fish! LOL! I decided I would be more frugal in the future and not buy the frozen salmon patties. Dice it up and serve in a casserole. I always like white fish with a Salsa Tomato type topping. Something full of flavour. Then you can kind of hide the flavour. But my husband refuses to eat fish and the daughter uses that as a reason to refuse as well! Keep on up with the creativity! It can be frustrating and hard to live with cheer but you can do it right now! If your library has Nava Atlas' 'Vegetariana,' her curried lentils recipe is very good. Also, you can look at the 'budget cooking' forum on recipezaar. A fair number of discussions and ideas there. What is "egg lasagna"? Thanks. Grilled fish tacos? You can make homemade tortillas very easily and you will never go back to store bought. The nice thing about fish tacos for those who aren't crazy about fish is you can top them with salsa/diced tomatoes, and all kinds of toppings. DH isn't a huge whitefish eater but goobles these up. Rachel Ray has some good recipes on the food network site. I love Amy D's philosophy on not having an attitude of deprivation through frugality - that alone can get any of us far in life by having the right attitude. What a blessing that you have savings to fall upon if need be - although not the "chosen" avenue, it must be comforting to know it is there. Perspective is very important I feel in life. It is always interesting to me how people view things; there are some with very little that feel they are blessed with everything in the world (I stand in humility of such people). These are the people we often read of who have nothing but the clothes on their backs, a little food, and a tiny 1-room house to live in, but are often the most generous and giving people in the world. Compared to the rest of the world we are all so rich. When I am feeling a bit low all I have to do is to remember those in other countries trying to make it through another day by finding some food, or the thousands of people devastated by earthquakes, floods, etc. even now as we sit on our computers, in our lovely homes, with food to eat, clothes to wear and so much more. Yes, what blessed richness indeed! If someone from a 3rd-world country entered my home, what might they feel? That is convicting to me (even though I live quite modestly). Although I am sure you might not have even thought about this, perhaps the word "poverty" (in your original post) should be used in the content for those it truly applies to. Definition: 1. the state or condition of having little or no money, goods, or means of support; condition of being poor; indigence. Just a thought to kindly bring to your attention. 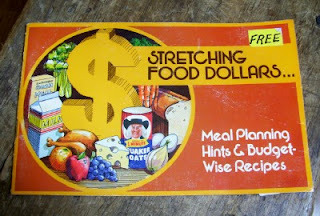 Your "Stretching Food Dollars" cookbook is worth at least 4.50 on ebay. Something to make you smile. If you need recipes for fish try the saving dinner website. 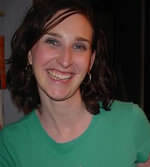 Leanne Ely does a lot of fish recipes. You could batter them with mayo and seasoned bread crumbs. Or try a beer and cheddar cheese fish chowder. Anon beat me to the suggestion of fish tacos. Bread the fish, bake or fry it, put it in tortillas, then top with salsa and whatever else you want. Personally, I like them with a nice, vinegar-based coleslaw. Delicious! Might I suggest fish tacos/wraps? Or fish enchiladas? We are not big fans of fish around here, but have eaten fish enchiladas thinking they were chicken. 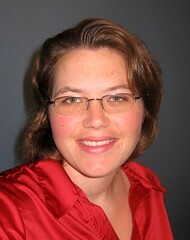 Hello Meredith, how about trying them on fish cakes made with your white fish. Just put the fish in the food processor to pulverise it, then add a chopped onion, some parsley, chives or coriander, S&P, a beaten egg, half a cup of breadcrumbs or mashed potato and form into patties. You can have these with a dipping sauce, with salad or vegetables or as a fish burger. I do not like fish, but I will eat this recipe! Dip the fish in olive oil or italian dressing, then in seasoned breadcrumbs. Bake until cooked, and serve with lemon juice. It is so delicious and simple (read: frugal). We're working through the pantry ourselves. After a heavy load of expenses at the start of the month, we have to stretch our food budget, too. Thanks for the inspiration!